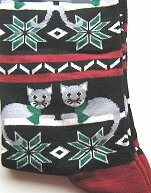 Grey cats are featured on these special holiday socks. These cat socks are made of 51% nylon, 46% cotton, 2% spandex and 1% rubber. They fit women's sock size 9 - 11.